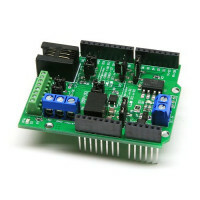 The I2C-XIO is a 40-channel digital I/O expander with an I2C interface, based on the NXP PCA9698. The board includes two 6P6C I2C Connectors, the PCA9698, a 5V @ 1.5A switching regulator, three address jumpers to select 1 of 8 possible addresses, and all I/Os pinned out to either terminal blocks or RJ11 jacks (in blocks of 4 I/O lines, including +5VDC and Ground on the other two pins). Unlike many other I2C I/O solutions on the market, the PCA9698 doesn't impose significant restrictions on the total current it can source or sink. Many parts rate +/- >20mA per I/O pin, but are severely limited by the total current the part can handle. The PCA9698 is rated for sourcing 500mA and sinking a whopping 1100mA, allowing for significant current draw on each I/O line. We've also included a 1.5A switching regulator on board so that you can achieve those current outputs without wasting significant power or hitting thermal limits. 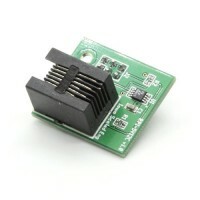 The I2C-XIO is purely an I/O expander, and doesn't integrate either an MRBus interface or microcontroller. For those interested in the same functionality, but with an onboard ATMega328 and MRBus interface, check out the MRB-XIO. 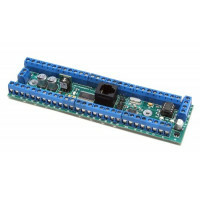 For Arduino users looking to expand the number of IO lines (up to 8 * 40 = 320! ), be sure to check out the XIO Library Reference for details on the XIO library and example sketch. 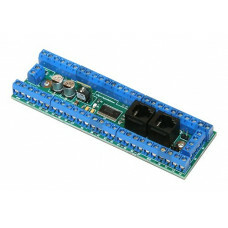 The MRB-XIO is a 40-channel digital I/O expander with an I2C interface, based on the NXP PCA9698.&nb..